HOUSTON, TX — On Tuesday, June 17, the hosts of morning radio show "The Roula and Ryan Show," on 104.1 KRBE, started up a fun conversation about late night TV. You see, the night before, "The Tonight Show Starring Jimmy Fallon" aired its newest rap remix featuring NBC News anchor Brian Williams. If you haven't seen it yet, you seriously need to watch Brian Williams rap "Baby Got Back," which has racked up more than 3.8 million views on YouTube and counting. All of these Brian Williams raps have gone extremely viral, because they're just plain hilarious, with "Rapper's Delight" topping them all with 11.9 million views. Whoa baby. So, back to the radio show: SnapStream was surprisingly brought up in this context and we thought, "Cool, they're talking about us on the radio!" Our TV search and clipping technology is known as "the secret weapon" to creating satirical clip montages at "The Daily Show with Jon Stewart," "The Soup," and "The Colbert Report." While "The Tonight Show Starring Jimmy Fallon" is not a SnapStream customer (yet), they totally should be! They could crank out these Brian Williams raps at a furious pace if they were using our ridiculously fast TV search. Just sayin'. And thanks again to the team at "The Roula and Ryan Show" for the amazing shout-out on the air, in our shared hometown of Houston! 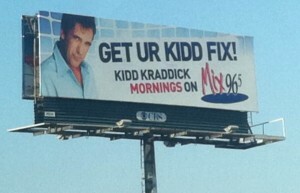 Over the past 2 years, SnapStream has become an invaluable resource to Kidd Kraddick in the Morning. Every single day we use SnapStream in several ways. With this program we are able to locate content that is specifically targeted at our demographic and use this content to entertain and inform our audience. On the video version of Kidd Kraddick in the Morning, KiddTV, commercial breaks are not full of boring infomercials or the same 4 songs your radio station plays, it is loaded with pop culture content from Entertainment Tonight, ENews and the late night talk shows to name a few. Without SnapStream the entertainment value of KiddTV and Kidd Kraddick in the Morning would not be at the high level it is today.